What is the Negative Impact of GMO’s? Altering the natural state of foods creates compounds that the body cannot easily identify or digest. These foods are linked to allergies, neurological disorders, fatigue, depression, nausea, loss of mental clarity, and even cancer. 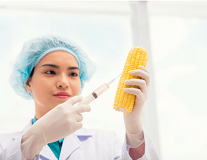 Genetically modified foods or GMO’s effect the body’s sulfur metabolism which is involved in the ability to detoxify, and make important neurotransmitters, or brain messengers such as serotonin. Serotonin effects many things including mood, sleep and appetite. Genetically modified foods are in everything including baby formula, (especially soy-based). Soy products are incredibly high in GMO’s, and they have been linked in studies to anxiety and aggressive behavior. Genetically modified foods are also in farm-raised fish (from the grain they are fed), dairy, and many other grains. In one study, rats fed with GMO foods were antisocial, irritable and aggressive. Those that were fed with non-GMO foods were calm, and did not express the other characteristics. Pigs were shown to contain the same type of results. When re-started on non-GMO feed these behaviors reduced significantly. In 1999, The Lancet, which is the world’s leading general medical journal published a study on rats that were fed potatoes loaded with GMO. In less than ten days their stomach lining had become much thinner and had weakened substantially. Similar evidence has been seen in other livestock fed with GMO feed. This raises the concern of what it is doing to the intestinal tract in humans. These symptoms are comparable to those of children on the autism spectrum. When the lining of the digestive tract is weak it is vulnerable, and therefore, easily permeated. Likely one reason why leaky gut is so common among them. Avoid genetically modified foods. Eat organically whenever possible, and keep the lining of your digestive tract strong. Get your free guide of 15 foods to help heal your gut and 15 foods to avoid for a healthier gut and better brain function. Authored by Karen Thomas, Founder of Healing Autism Naturally.